Hello, my friend, if you have the black color eyes, you are really lucky that you can wear any kind of poker UV contact lenses without changing your eyes' original color or appearance. Here you can buy two kinds of UV contact lenses specially for black eyes. One is the ordinary ultraviolet ink contact lenses. These UV contact lenses with large laser staining dyed area can see the marks on the back of all kinds of professionally cheating cards 100% clearly. Actually these UV contact lenses can see the trick marked deck more clearly than any other similar playing cards cheating devices. The ultraviolet contact lenses for poker which developed by Golden Sunshine, the price is cheaper than any other cards cheating contact lenses. These special contact lenses will make whole brown eyes little bit darker than before. 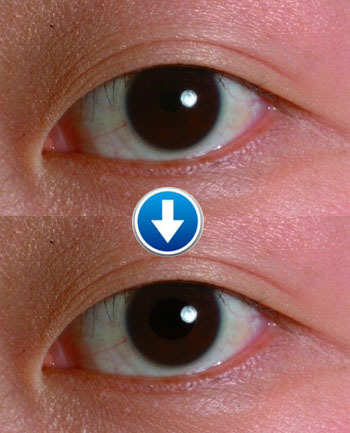 If you mind to change your eyes' color, to let the color of your eyes black, you can choose our newest high definition UV ink contact lenses. This kind of poker cheating contact lenses will not change your eyes color at all. According to customers' favor, customers can chose the uv invisible ink contact lenses which can see the surrounding environment very clearly but can not see the marks so clearly or which can see the surrounding environment not so clearly but can see the marks very clearly. Of course, these ultraviolet ink contact lenses will be more expensive than the ordinary contact lenses. With these UV contact lenses, customers can easily know each card of any brand like face up. However, rigged cards marking also can be seen by marked cards sunglasses, you can choose them according to your hobby. As far as we are concerned, UV ink contact lenses are better than marked cards glasses, for poker lenses can see more well in blue cards, and they will not be noticeable by other poker players. Reply: Thank you for your inquiry of lenses and ink. We will reply you by email. Best regards. Content: I want to purchase safe contact lenses that can pick up invisible ink instead of using the blue light. I have green/hazel eyes. Do you have something for this? Reply: Thank you for your inquiry of contact lenses invisible ink. We will reply you by email. Best regards.